How Do You Get Your Free Fly Fishing eGuide Download? To order one of our free downloads simply order and any normal product. These will be processed and available immediately for you to doanload. Login to My Account on the top right of any page of the website at www.theessentialfly.com. You will see 3 options available, Personal Informaiton, Event Reminders and Order Information. Click on Order information and all of your orders iwll be displayed. Select the order on which your eGuide was ordered. 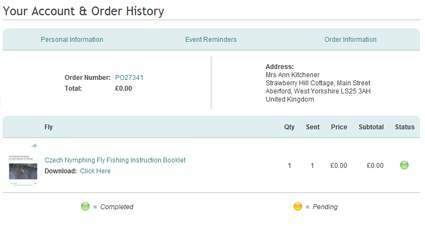 Now you will see details of the order with a Link to download the Free Fly Fishing eGuide. Simply click on the download button.